One of the major benefits of living in a city that has its own Apple stores is that you get to try the new products even before they are available for purchase. After a wait of 7 months the much anticipated Apple Watch finally became available for pre-order, which means the device was also ready to be displayed in the stores. Unlike iPhones Apple is selling the Watch on its online store only, so the device cannot be purchased from any of its stores. However to allow potential buyers to get an experience of the company’s first ever wearable gadget the new Apple Watch is on display at stores and is also available through what Apple calls ‘try-on’ sessions. 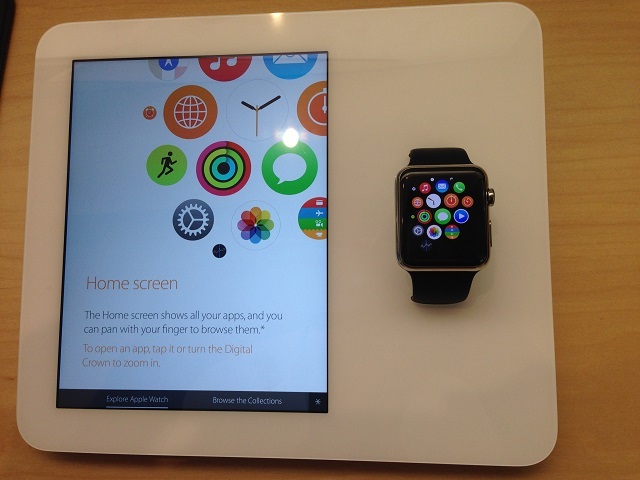 There are two types of display units in Apple stores. The demo display units are attached with a panel so users can use the device but cannot wear them. The other display units are encased securely inside a table with a glass surface and are only meant for viewing purposes. Since Apple Watch is such personal device that you not only need to hold in hand but also wear on your wrist to get a proper feel of it, Apple has started the appointment based try-on sessions in which you arrive at the store at the previously booked time and get to wear any Watch model of your choice for a duration 15-30 minutes. During this time you can ask any questions, try out different straps, take photos or do whatever you like with the device. Even though I have no plans of buying the Apple Watch in the near future I decided to go to the Apple store here in London and try out the device. I also wanted to see if the device is even worth the hype Apple has managed to gather around it. Before going I went to Apple’s website and booked a try-on appointment. The website first asked me to select the store I wanted to go to and then gave me a bunch of time slot options to choose from, and the Watch models I was interested in viewing. You can choose between Watch, Watch Sport and Watch Edition models. Watch Edition models are not available at all stores. I selected the 5.30 PM slot. At sharp 5.25 I walked into the Apple store and told the friendly Apple Store employee that I have an Apple Watch appointment for 5.30. After confirming on his handheld device he introduced me to his colleague name Eva who was going to assist me during my try-out session. 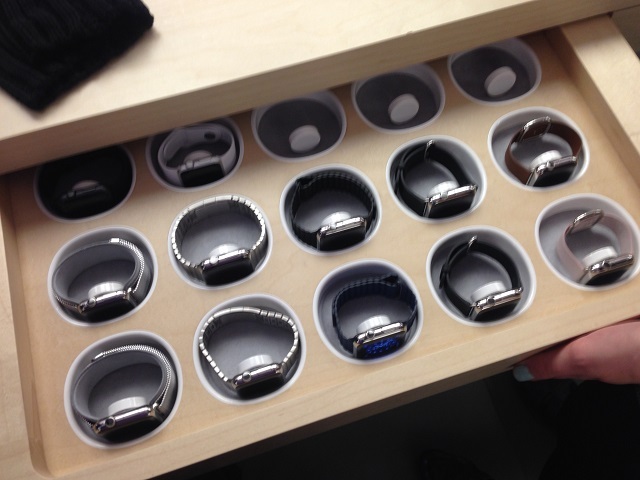 I was taken to a designated area of the store where Eva opened a drawer full of different Apple Watch models (FYI, If I ever become super rich I will have a similar kind of drawer full of Apple Watches at my home). The drawer could only be opened with the devices Apple Store employees hold in hand (the ones that have iPods fitted in them). Once the drawer opened she asked me to choose the Watch model I liked. I picked the 42mm Stainless Steel Case Watch with Link Bracelet. Before handing over the Watch into my hands the employee introduced the hardware of the device and explained its different features such as the screen material, digital crown, back sensors, strap etc. I told Eva that I will be taking a lot of photos for my blog to which she was very encouraging and told me to take as many photos as I like. After I had a proper look at the body of the Watch the store employee asked if I was ready to try it on. Then she assisted me while I was wearing the Watch, even though I didn’t really need any help. This seemed a bit awkward since this was the first time ever someone was ‘assisting’ me while wearing a watch. While I was hoping to use the device when it was on my wrist I soon realized that the demo try-on units don’t really run the Watch OS, they are specially designed models that only play the video showing features, apps and UI aspects of the Watch. Although you get the feel of how the device will look you don’t actually get to use it while its on your wrist, which is a shame. During this whole time Eva kept on telling me about the features of the device including the Messages, its running features, stock apps, security features, taptic feedback and more. More importantly she was talking about how the Watch looked on my wrist and how the particular model I was wearing would be good for both casual and formal dressing. Anyways as I was taking photos the store employee informed me that I can try another model on if I want to. I quickly removed the Watch from my wrist and asked for the Black Sport Watch. Before handing over the second model to me the employee talked about this model’s physical aspects and features of the strap. She then assisted me in wearing the Watch, however this time it didn’t feel as awkward as it did the first time around. Again I took a bunch of photos and even recorded a video while the Apple employee patiently smiled and kept talking about the features. I have to say that the friendly atmosphere was very helpful. I was told that I still have time left from my 15 minute appointment so I can try one more model. I took the opportunity to try the model with the Leather loop. After I put on this particular model I felt a lot different than the previous two models. This one felt less premium than the Stainless Steel and Sport Band models. At the end of my 15 minute try-out session the Apple store employee told me that I can now go to a demo terminal and try the software of Apple Watch. She took me to an empty terminal, asked if I had any questions about it and then went on to take the next appointment. 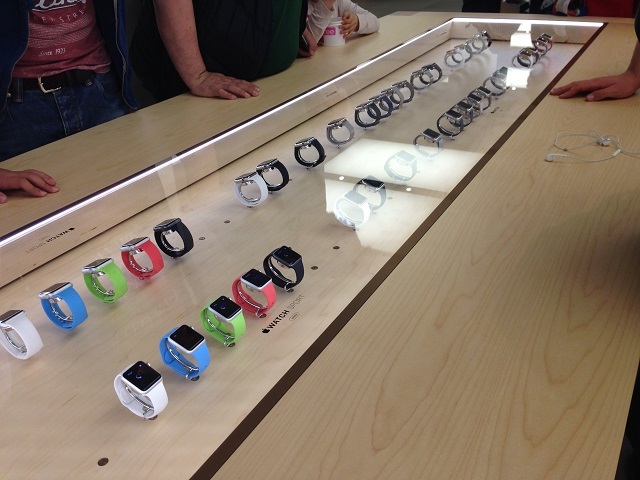 To conclude I would say that I am glad that I took time off my day and went to an Apple Watch try-on appointment. This not only made me understand how the device works but gave me an opportunity to actually wear it. Even though I had looked at hundreds of photos of Apple Watch since its first announcement back in September looking at it in person and wearing gave me a completely different experience. 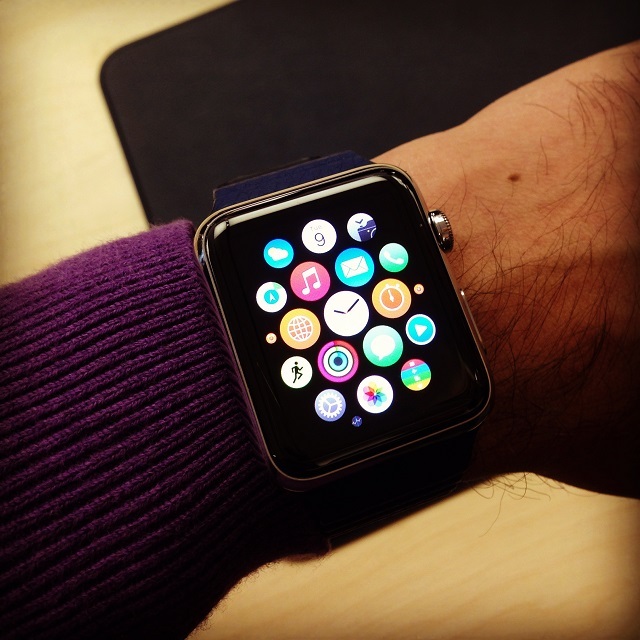 If you are someone who has even the slightest interest in purchasing the Apple Watch then you should definitely go to your nearest store and get the feel of the device. This experience will also help you in choosing the best strap for yourself. Trust me you won’t regret it. Don’t forget to book an appointment before going. Check out rest of our Apple Watch coverage at our Watch section.